When we stand united, we win! Since May, Certified Nursing Assistants and Patient Team Support workers at Sacred Heart at Peace Health in RiverBend have been fighting to save healthcare jobs and protect patient care against management’s unacceptable plan to drastically cut hours, eliminate and reduce benefits for SEIU members, and force major schedule changes in every department. 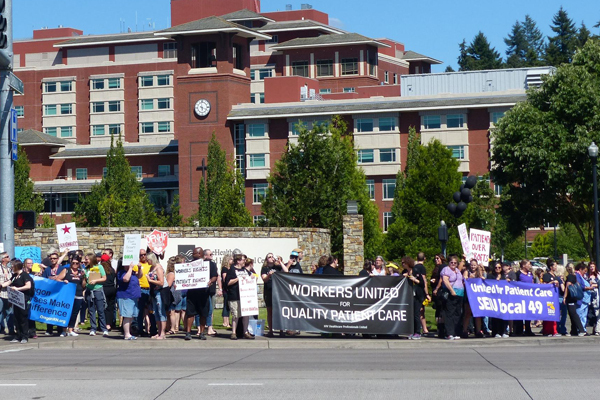 Our union took strong action by rallying with doctors and RNs, stickering up across the hospital, and making it clear that management was not putting patient care first in their proposed restructure. Together, SEIU members won a fair bidding process, limited the amount of impacted staff, guaranteed voluntary severance for affected members, and secured positions for displaced caregivers with limited changes of benefits and limited changes to full time employees. SEIU members will continue to hold management accountable to make sure patients receive the best care, and that management respects our rights as union members.